Posted 12-26-2014 by Dale Bohman. In our last blog entry we gave you three very important reasons why you should invest in a vehicle wrap.Today we are going to discuss the different types of vehicle graphics and help you to decide which coverage area best fits your needs and your budget. A Full Vehicle Wrap is the most cost effective solution when it comes to mobile advertisement. You are using your entire vehicle while you are out spending money running errands, grocery shopping, buying gas, etc. Why not use your vehicle to make money? Make the most of your vehicle by using its total area for a bold display of your company name. Spectators will have no choice but to see your logo calling loud and proud! 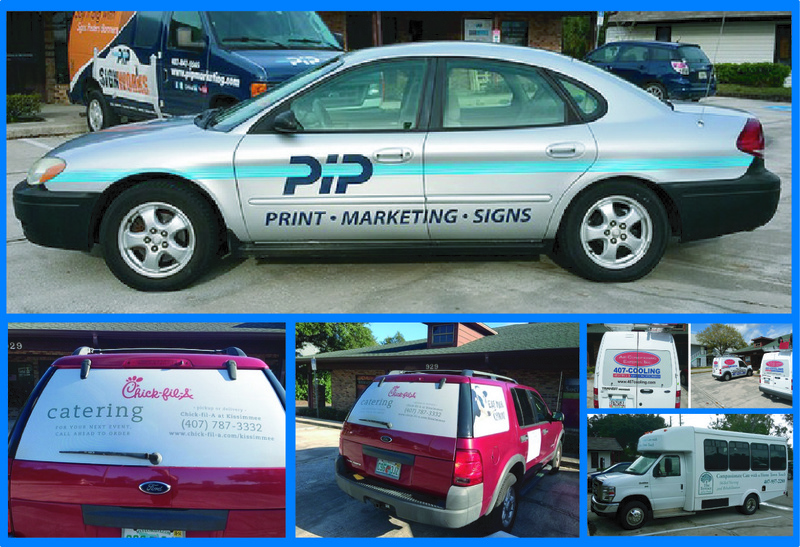 Full vehicle wraps usually include coverage of all exterior painted surfaces of the vehicle and perforated window printing. If you are a bit unsure about hiding every last inch of your vehicle under a graphic display, then a Partial Vehicle Wrap is a great option. It’s also a great option for those who are a bit more budget conscious. A partial wrap promises to give you the same great exposure that a full wrap offers without committing to the heavier coverage and the cost. As you can see in the examples below the partial wrap graphics are mainly applied to the rear section/and or bottom half of the vehicle. Do you bring your work vehicle home? Some home owners associations have rules and regulations pertaining to the vehicles that they allow in their divisions. A friendlier option for this would be an individual graphics/lettering application. Smaller vehicle graphics provide great flexibility because you control exactly how much coverage you want and exactly where you want it placed. You can also apply your graphics on magnetic material so they can be easily removed and replaced when needed. Whatever your vehicle graphic decision, just be sure to get your company name on your vehicle and make it start working for you today. No vehicle graphics = no advertisement = no exposure =NO SALES!